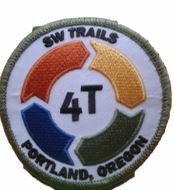 Not sure how to get to the 4T? You can start anywhere along the route. Click on the access point where you want to start, enter your address, and Google will happily provide you with directions by car, bus, bike, or foot. Once you’ve gotten directions, use your browser’s “Back” button or arrow to return to this page. Where the tram meets the trolley at the South Waterfront. South Waterfront where the Tram and Trolley meet. Click map to get Google map. For directions ask Google. There is no good free parking for hikers in the South Waterfront area on weekdays. OHSU’s Center for Health and Healing has an underground garage just south of their building. On weekends there is usually on-street parking available in the Lair Hill neighborhood around SW Gibbs and SW Corbett. Beware: The streets in this area are quite confusing so you will want to pay attention. Once you have parked you can walk across the amazing Gibbs Street pedestrian bridge to the tram and trolley. Where the tram meets the trail at OHSU. OHSU where Trail and Tram meet. Click map for Google map. For directions ask Google. There is no good parking for hikers at OHSU on weekdays. On weekends some on-street parking is available and parking meters don’t need to be fed. The OHSU campus is very confusing. Their OHSU campus map might help. The tram is reached by going thru the OHSU hospital building from Sam Jackson street. There are “to the tram” signs. If you are coming by bicycle, there is bike parking in the garage next to the Casey Eye Institute. Take the garage elevator to the “bridge” level. When you exit the elevator, follow the “to the tram” sign out a door, along a catwalk to another elevator which takes you up to the tram. Zoo – where Train and Trail meet. Parking at the zoo costs $1.60 per hour. All day parking is $4.00 a day October to March and $6.40 a day April to September. Parking may be scarce on busy weekends. Downtown where Train and Trolley meet. Click map for Google map. Parking in downtown Portland is available at the SmartPark garage at 10th and Yamhill and on-street parking at $1.60/hour on both weekdays and weekends. Once you have directions, mosey on over to Take a Hike to see our trail guides for your particular starting point.